Mercy doesn't need Pharah to fly anymore. Can fly by herself. Hi! 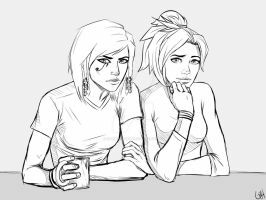 I'm making a thread on twitter about my favorite ships and i want to include pharmercy. can i use this fanart as an example? of course i'll credit you. Not a huge Pharmercy ship fan but this is adorbz! we're Ying and Yang, you give me the wonderful, lifting waves! I read "Pharmacy" hehe...Get it ? Lovely art, by the way. That's an interesting healing method seems to be effective though. Heh, that's a cute wordplay there, I get it. Haha this one certainly has me interested.So thanks for the awesome draw. Uhh, when did this OTP get introduced, and for what reasons? I'm just curious, as a fan of the game, because I don't really see any signs that they are together, or would have any reason to be. So that means they're both lesbian and in a relationship? Who is the girl with the eye of Ra tattoo? She looks kinda like Korra.